Zimbabwe's long-time president Robert Mugabe is holding talks with South African negotiators over his future, according to BBC reports. Envoys from the the Southern African Development Community (Sadc) are trying to reach a deal on the future of Zimbabwe and the man who has led the country for 37 years. Mugabe, 93, was put under house arrest on Wednesday after the army moved to take control. Sources suggest Mugabe may be resisting pressure to step down, insisting he remains the legitimate president. A Roman Catholic priest known to Mugabe for years, Father Fidelis Mukonori, is trying to mediate a deal on his future with the military. The source said Mugabe is resisting mediation by the Catholic priest to allow the 93-year-old former guerrilla, a graceful exit. South African Defence Minister Nosiviwe Maphisa-Nqakula and State Security Minister Bongani Bongo are meeting Mugabe on behalf of Sadc, which South Africa currently leads. Sticking points are said to include what role Mnangagwa will play and the security of Mugabe's family. The Sadc mission will be pushing for a democratic solution. The body, which represents 16 countries, does not support coup-led governments as this would set a dangerous precedent in the largely peaceful region. A Sadc emergency meeting was scheduled to take place in neighbouring Botswana to try to help find a resolution. 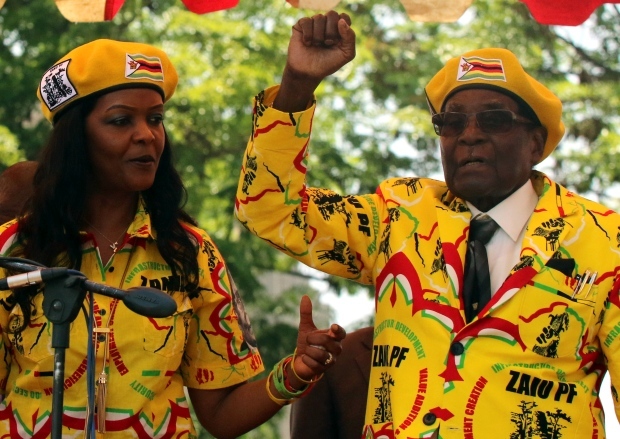 However, the power struggle over who might succeed him, between his wife Grace Mugabe and her rival former Vice-President Emmerson Mnangagwa, has split the ruling Zanu-PF party in recent months. Last week, Mugabe came down in favour of his wife, sacking Mnangagwa, a veteran of Zimbabwe's anti-colonial struggle. The head of the African Union, Guinean President Alpha Condé, has warned the AU "will in no case accept" the military seizure of power. He said he was "inviting the army to return to its barracks and return to constitutional order". Zanu-PF's UK representative, Nick Mangwana, told the BBC that Mugabe could remain nominally in power until the party congress in December, when Mnangagwa would be formally installed as party and national leader. Reuters news agency is quoting a source as saying Mugabe's wife Grace is in Mugabe's compound, along with senior figures from the "Generation-40" group supportive of the first lady - cabinet ministers Jonathan Moyo and Saviour Kasukuwere. Grace Mugabe had previously been thought to have fled to Namibia. There is little public affection for 52-year-old Grace, a former government typist who started having an affair with Mugabe in the early 1990s as his first wife, Sally, was dying of cancer. Whatever the final outcome, the events could signal a once-in-a-generation change for the former British colony, which was once a regional breadbasket.